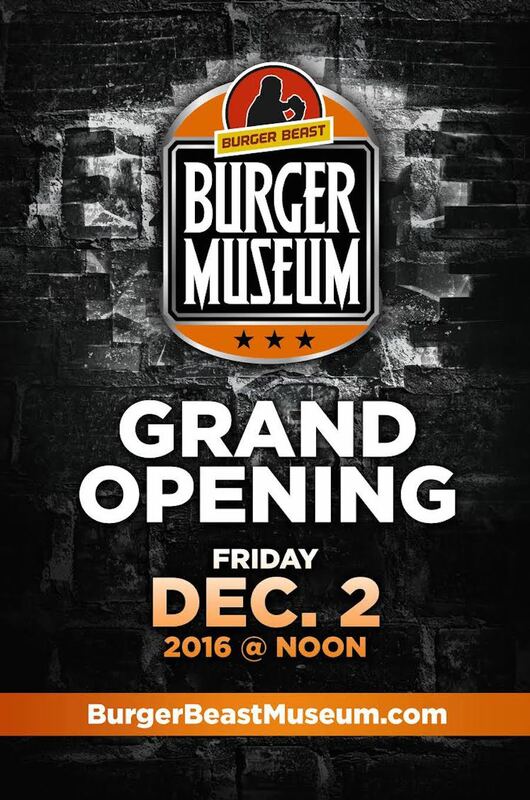 * Burger Beast Museum Grand Opening- 12/2/16. Jeff Eats kinda knows that most of you guys won’t-be-dropping-everything to run there, nor will the Burger Beast Museum be on too many “bucket lists”- that said, next time you’re at the Magic City Casino playing/eating/concert going- the Burger Beast Museum sounds like something you may want to check-out! Wrappers and boxes from classic Whoppers and Big Macs fill display cases. Vintage uniforms from Wendy’s and McDonald’s adorn mannequins. Ash trays, collectible drinking glasses and menus from former local and national chain restaurants such as Red Barn, Sambo’s and Wuvs also have a home here at the new Burger Beast Burger Museum at Magic City Casino in Miami. The museum is an extension of Gonzalez’s love of burgers and their history. He was working as a retail manager in 2008 when he began burning out and feeling frustrated. But it wasn’t until a friend gave him a sign from an old Burger Chef restaurant that Gonzalez developed an insatiable curiosity about long lost and still around burger joints. Here are some of the best burger joints in South Florida. From traditional beef patties to ones with elk meat, topped off with everything from caramelized onions to fried cheese curd, these restaurants sure know how to dress a burger. “Burger Chef started it and then I got into [collecting] McDonald’s and Burger King,” said Gonzalez, who scoured eBay, Craigslist and garage sales for hard-to-find items. “Yes, I have a problem,” he said with a guffaw. Over the years, people donated name tags, cups and other items to his collection. “It’s like capturing my childhood,” said Gonzalez, who grew up in Westchester in southwest Miami-Dade County. He remembers eating at different restaurants on Thursdays with his family when his mother would get out of work early from her office job. One of his favorites was Burger King because there weren’t many McDonald’s nearby. “[At Burger King] I started off with one cheeseburger, then two cheeseburgers. I always did no pickles and then I graduated to a double cheeseburger and then just a cheeseburger,” he recalled fondly. That was when cashiers wore floppy golden and brown hats and repeated orders on microphones. The museum is thick with South Florida nostalgia and slices of history. Did you know that there was a Burger Castle chainstarted by Charles Krebs, Burger King’s first franchisee in Miami? Or that Kentucky Fried Chicken had a spinoff called Kentucky Roast Beef and Ham? Or that Red Barn burger chain was based in Fort Lauderdale in the 1960s? Visitors could get lost marveling all the items on display at the burger museum. There’s a giant figurine of Officer Big Mac from McDonald’s and one of the infamous Hamburglar. A framed black and white photo from the first Royal Castle in downtown Miami. Gonzalez even has a corner table for two from a Wendy’s with a framed photo of late founder Dave Thomas. Gonzalez is still adding the final touches on his museum. The documentary “Hamburger America” will play on a loop in front of a dining booth. He is also building a chicken coop to hold items (a portrait of Colonel Sanders for instance) from fried chicken eateries. really put a smile on my face. If you happen to be at the casino MAYBE but $10 is absurdly high.